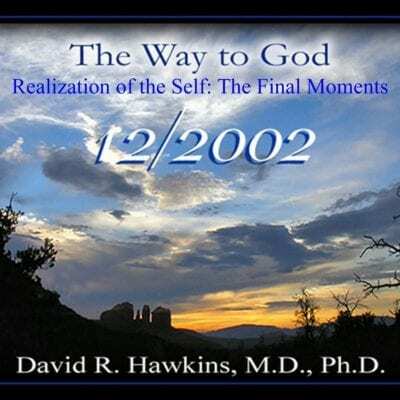 The preceding 11 lectures in this series were in preparation for this most important final talk of 2002. Dr. Hawkins reveals the real purpose in giving these lectures, which is to remove the barriers so that what is within shines forth. The energy of that Truth is what the teacher transmits, not to one’s mental bodies, but to one’s higher spiritual bodies. It’s a vibration that gets activated, which can only come from a certainty of the absoluteness of the Presence. All doubt, that can only come from ego, is now removed by the experience of the Self as the Infinite Presence. Dr. Hawkins guides us through this process in this exceptional talk, giving us everything we need to know. And at the end, he walks us through the process of going through the final doorway, which every serious seeker of enlightenment needs to hear in order to make the transition. Gloria in Excelsis Deo!